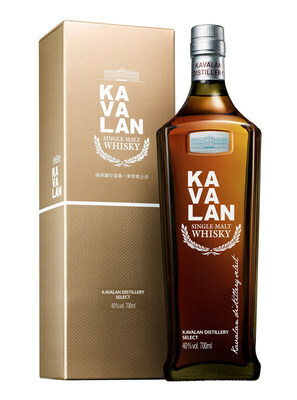 TAIPEI, Taiwan, Nov. 27, 2018 /PRNewswire/ — Drinkers can now purchase a whisky from award-winning Taiwanese distillery – Kavalan, at US$59 RRP 43% ABV in the US and 49 euros 40% ABV across Europe. Kavalan CEO Mr YT Lee said the newly launched 700ml “Kavalan Distillery Select” had a good price point and was aged in some of the world’s finest refill casks within Yilan’s climate, creating an elegantly balanced drop with notes of soft toffee and lively fruits. Kavalan’s distinct fruity flavours are green apple, mango, pineapple, and cherry. Master Blender and Global Brand Ambassador Ian Chang said people could rely on Kavalan’s consistency of quality. “Kavalan is known for quality, because this is our focus. But now, with Distillery Select, we are giving people quality at a very good price,” he said. “In less than a decade of making whisky, the Taiwan distillery has received worldwide acclaim and now has 23 varieties with the introduction of this new style,” he said.